Fundraising to support the Chincholi football club by providing the players with kits and equipments! Soccer Club Chincholi (SCC) is a Chincholi based football club started in 2007. The club is a brainchild of a few football enthusiasts from the vicinity. It was their dream to create a platform for young individuals of the neighbourhood to showcase their talent. Since we only play in the lower division of the leagues, we are not yet registered and so far doesn't require a formal registeration except with the league. 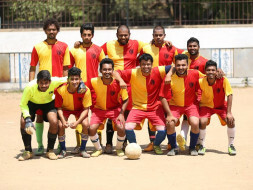 The club practise takes place in Venus Park thrice a week and sometimes friendly matches with Sunder Nagar Football Club at Sunder Nagar grounds. As the new season is nearing, we are looking for sponsorship for the season. This season, the club has recruited a lot of players and is also keen on developing their skills by providing them with football kits for the same. We are also falling short on the desired number of kits and equipment for the team! The sponsorship will be put to use in developing the skills of newly recruited players as well as buying the equipment for training and providing kits for the players of the team. Also the Any remaining funds would be used for hydration of players during the matches and a mini tournament to be held in the vicinity, where the advertisement of the sponsor shall be done on a large scale. Every little support here counts - you can contribute as little as Rs. 500 or more. Do share this campaign page on Facebook and other social media channels you use. We thank you for your kind support. Proud of being friend of Kiran Kelkar. All the best folks! For the love of this beautiful game.